SILVERNOISE Ltd. is a direct Music Agregator to all major legal online shops worlwide. We deliver music content to more than 200 well-known and established international platforms for legal music downloads and ringtone outlets: iTunes, eMusic, Amazon, Napster, Rhapsody, Digital 7, AOL, MusicNet, Beatport, Juno are just a few to name. We also provide music distribution services for CDs in retail shops throughout Austria and Germany. Please be aware of the fact that today it is hardly possible to sell CDs in retail shops unless you are already a well known artist in your area. Therefore we recommend newcomers to start their career by delivering music first to platforms for digital downloads - thus they can have a great international feed-back on their music and effectively TEST their music on the international music market. If the music sells well digitally and the band is touring a lot it would make sense to start a radio campaign and make the CD available at retail shops. Today almost 40% of the turn over in music business is generated by digital downloads and the tendency is moving up every year with a rapid progression. We are convinced that digital delivery of music is definitely the future of music business. 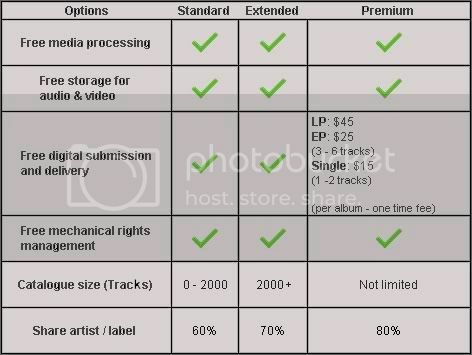 The Standard option is specifically tailored for labels and producers with small music catalogues. This option is only applicable if SILVERNOISE covers all online shops and teritories, no exclusions. The Extended option is aimed at labels and producers with medium and large music catalogues. The Premium option is for labels which are holding in their hands the next big hit, feel free to choose it for a premium share distribution. We can prepare for your band a professional press kit (also an electronic one) and get your music reviewed by hundreds of music editors worldwide. We deliver music to the best regional FM- and hundreds of licensed international Internet radio stations. Publicity and airplay is what your music needs in order to sell good and we can arrange this for you. It is very important to know where to send your music - according to the music style you play. A lot of bands make their promotion on their own. And that way they tend to do numerous mistakes - for example there is no use to send music for a review to a rock editor or a Metal Music Magazine if your band plays soul or electronic. Music marketing research is crucial for every music promotion and that's our job. Musica, CelC , Virgin , MTN. iTunes, eMusic , Napster , Puretracks, Yahoo Unlimited, iMesh. iTunes, MSN , MediaMilkShake, MTV , NYT.FI, MusicBrigade. iTunes, VirginMega, Europe2 , Pepsi , MCM , Carefour (BooStore), TX (Traxdata) , AOL , L'Internaute, Club Internet, VirginMega Clasique, FnacMusic , FnacMobile , e-Compil , NRJCokeMusic, Cdiscount , Alapage , Alice, Cora, France Loisirs, M6 , MSN, MTV , PackardBel, Système U , Starzik , Fre , Orange, SFRMusic, Waxx Music, M6 , MSN Music Videos, Samsung , MusicMe , 4Deejays, Madnug, 121 Musicstore. iTunes, iMusic , MusicShop, Media WorldNet Music, MSN , MTV , Radio 105, 105 Clasics, Radio Montecarlo, United Music Store, Tiscali. iTunes , Coke Tunes, Vodafone.